A Russian Progress supply ship loaded with 6,000 pounds of equipment, supplies and propellant, completed an automated docking with the International Space Station Jan. 29. The unmanned cargo ship was launched two days earlier from the Baikonur Cosmodrome in Kazakhstan and carried out a trouble-free rendezvous with the space station, maneuvering to a docking with the Pirs module on the Earth-facing side of the Zvezda command module at 9:39 p.m. EST Saturday. The linkup, monitored by flight engineers Alexander Kaleri and Oleg Skripochka, came two days after the successful berthing of Japan's HTV-2 cargo ship, which was captured by the station's robot arm and attached to the Earth-facing port of the forward Harmony module. 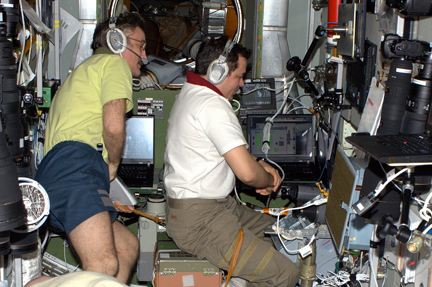 The HTV-2 spacecraft brought nearly 8,500 pounds of equipment and supplies to the station. The Progress 41 spacecraft was loaded with 1,918 pounds of propellant for the station's maneuvering thrusters; 110 pounds of oxygen; 926 pounds of water; and 3,080 pounds of supplies, spare parts and other equipment. Along with unloading the Progress and HTV-2 spacecraft, the station crew plans to begin preparing the lab complex for the arrival of the shuttle Discovery. Launch is targeted for Feb. 24, with docking expected two days later.